Upon arrival in New Delhi International Airport, our representative will greet and transfer you to the hotel. Dinner and overnight will be at the hotel. Have hearty breakfast at the hotel. Later proceed of sightseeing tour of Delhi covering places like Jama Masjid, Red Fort, India Gate, Humayun Tomb, Qutub Minar, President House, Parliament House, Lotus Temple, Birla Temple, etc. 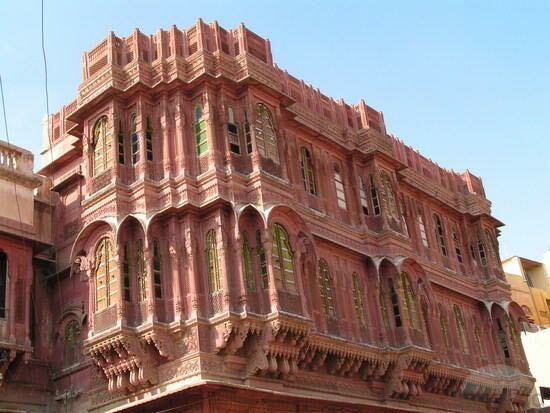 In the evening drive to Jaipur, the capital city of Rajasthan, famously called the Pink City of India. Upon arrival at Jaipur, check in at the hotel. Dinner and overnight stay will be at the hotel. 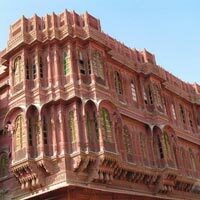 After breakfast proceed for city tour of Jaipur, the Pink City of India. Jaipur, the capital city of Rajasthan, is world famous for its magnificent forts & palaces; and some other attractions. Major attractions include Amber Fort, Junagarh Fort, Jaigarh Fort, Jal Mahal, Hawa Mahal, Rambagh Palace, Sisodia Rani Palace & Bagh, Govind Devji Temple, Birla Temple, etc. Explore local bazaars in the evening. Dinner and overnight stay will be at the hotel. Have relaxed breakfast at the hotel. Fly to Jodhpur. Reach and check in at the hotel. Later proceed for sightseeing tour of Jodhpur, the Blue City. Major attractions include Mehrangarh Fort, Jaswant Thada Memorial, Umaid Bhawan Palace, Ghanta Ghar, etc. Dinner and overnight stay will be at the hotel. After breakfast drive to Jaisalmer, situated in the Thar Desert of Rajasthan and famously called the Golden City of India. On arrival, our representative will assist you to transfer you to the hotel. Later, enjoy camel safari rides to Sam Village. Explore rippling sand dunes with exciting camel rides. Meet local people. Feast your eyes with cultural bonanza in the undulating sea of sand. On time return to hotel in Jaisalmer. Dinner and overnight stay will be at the hotel. After breakfast embark on the sightseeing tour of the desert city of Jaisalmer, the Golden City of India. Major attractions include Golden Fort, Jain Temples, Havelis, Sam Sand Dunes and Camel Safari Rides. Dinner and overnight say will be at the hotel. After breakfast drive to Bikaner, Rajasthan. On arrival, our representative will transfer you to the hotel. In the afternoon, proceed for Bikaner tour. Major attractions include Junagarh Fort, Lalgarh Palace, Fort Museum and Camel Breeding Farm & Research Centre. Enjoy camel safari rides to nearby sand dunes. Dinner and overnight stay will be at the hotel. After breakfast drive to Mandawa located in the heart of Shekhawati region, Rajasthan. Check-in at the hotel. In the afternoon, visit the village with colorful frescoed mansions, temples and charming little shops. Explore the magnificence of Fort Mandawa Castle. Dinner and overnight stay will be at the hotel. Have hearty breakfast at the hotel. Drive back to Delhi. Our representative will drop you at New Delhi International Airport to connect the flight for onward journey with mesmerizing memory of camel safari tour s in India.